Proper cleaning of cracks involves removing vegetation, dirt, and debris from cracks that will allow the crack filling material to flow into the cracks and to adhere to the side walls of the crack. Popular crack cleaning methods include mechanical wire brushes and routers. After cracks have been cleaned or routed they should be blown out with a leaf blower, compressed air, or heated compressed air. Selection of crack filling materials includes deciding on whether to use cold or hot applied material. Typically, on highways and roads, a hot pour material is used due to rapid set-up times and minimal impact on traffic flow. Both hot and cold applied crack fillers are used on parking lots. Cold applied materials are commonly used on home driveways for control over the aesthetic look of the finished project. Application methods for hot pour crack sealants typically involve an oil-jacketed kettle with hot material being pumped directly into cracks. Hot pour materials can also be applied through a crack banding machine or a pour pot. Cold pour materials can be applied directly from container (gallon jugs), pour pots, crack banding machines and pump systems. Weather conditions for cold applied materials should be warm and dry. Hot pour materials can be applied in cooler temperatures (as low as 40°F). Cold applied materials should be allowed to cure for 24 hours prior to allowing traffic on surface. Hot pour materials should be allowed to cool for 15-20 minutes before allowing traffic. Severely cracked areas of pavement may need to be removed and replaced with fresh hot mix asphalt. 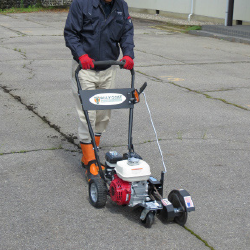 GatorPave from SealMaster is the ideal temporary solution for alligatored pavement. 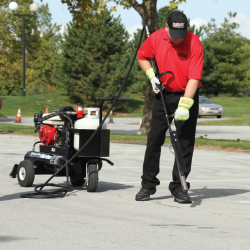 A systematic program of pavement maintenance that includes periodic crack filling and sealcoating will more than double the life of asphalt pavement.